There are a lot of quality marks and certificates within the textile industry. Most of them say something about sustainable raw materials or products. With the certificate for Sustainable Textile Production (STeP), OEKO-TEX® has laid down a standard for the production of textiles and clothing. EE Labels has always placed great emphasis on sustainability and corporate social responsibility. The use of Newlife™ threads and OEKO-TEX® Standard 100 threads is an important example of this. Our weaving machines also operate on 100% green electricity. By signing the Textiles and Apparel Covenant, together with other companies we have taken steps to improve sustainability within the textile industry. But for Europe’s most sustainable label producer this is still not enough. For this reason in 2016 we started preparations for the application process for the OEKO-TEX® SteP certification. Despite the existing sustainable nature of our company, the bar was then set even higher. 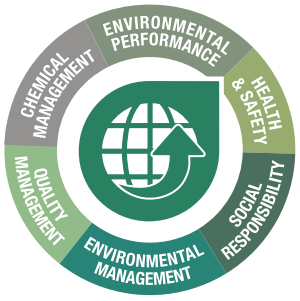 We have worked hard on a completely new management system in which even stricter standards are set for environmental management and quality. We look at the impact on the environment of all our business activities with the aim of reducing this load. By raising quality even further, waste and the unnecessary use of raw materials and energy are excluded. But attention is also paid to the sustainable deployment of our employees so that they can contribute to the production of our products in a vital and well trained manner. In January 2017 we were inspected for compliance with the strict standards for the SteP certificate. We achieved a high score in Level 2 and are the first production company in the Netherlands to comply with this standard, something that we are extremely proud of. Of course, it doesn’t stop at this milestone. We are continuing to improve the sustainability of our organisation and production. Suppliers and customers will be increasingly involved in this. As you can’t create a sustainable world on your own – we have to do it together!! !